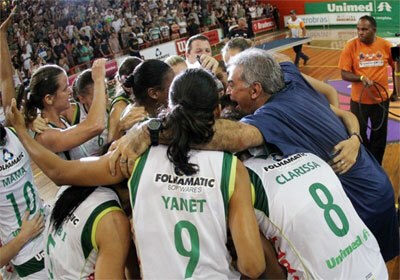 Americana are the champions of Liga de Basquete Feminino. They overcame Ourinhos in the second game of the Finals to sweep the series. Karen Gustavo (177-G-84) stepped up with 15 points to pace the winners. The teams stayed close throughout the opening quarter. The scoreboard read 12:12 after ten minutes of action. Americana pulled in front in the second term. They established a narrow 31:29 halftime lead. Americana maintained the lead throughout the third term. They entered the fourth frame up by three points 47:44. The hosts unloaded 22 points in the final stanza and did not allow Ourinhos to take over rolling to the victory. Mama Dantas (191-C-78) finished with 13 points, while Clarissa Dos Santos (184-C-88) accounted for 12 points and 9 rebounds in the win. Chuca De Oliveira (182-F/G-79) had game-high 19 points and 8 rebounds for Ourinhos. Silvia Gustavo (185-F-82, agency: Josep and Nicolas) had 14 points in the loss.